Antoine Terrieux & Camille Vacher | En Plein Vol—N.A.S.A. Artists never set limits to their multi-media explorations on diverse forms of representation, for an important character of contemporary art has been the tendency to cross boundaries and break through constraints. This exhibition aims to provide conceptual possibilities for an interdisciplinary approach, to demonstrate how contemporary art applies simple technical principles to reveal the plenitude of aspects, and to observe the artistic practices made possible by artists’ employment of physical or related sciences such as air, sound, light, randomness or control, and so forth. 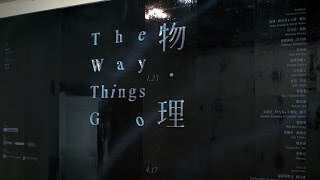 The Way Things Go strives to present one perspective that goes beyond the literal changes of things—it follows the hybrid, cross-boundary and interdisciplinary trends of thought to uncover the sense of such states of changes in a broader world structure and into the realm of contemporary art. The exhibition shows the location where art and the “way of things” meet. It does not work just in the sound, electric and air fields, but it also expresses its multi-layered intention through art installations, be it psychological, sensational, social, humanistic or abstract… The pure “grammatical” recognition as found in textbooks is materialized into phrases expressing beauty and making physical experience. Through showcasing the specific physical conditions arranged by the artists, this exhibition presents surprisingly colorful blossoming that differs much from what is produced in laboratories.